Do you have ongoing and chronic anxiety symptoms due to the complexities of living with fibromyalgia? With over-stimulation due to noise, lights, environmental toxins, it's no wonder that fibromyalgia can bring with it increased alertness that leads to anxiety. Symptoms of anxiety include rapid pulse, chest or head pain, sweating, temperature intolerances, insomnia, brain fog, higher than normal cortisol levels, gastrointestinal upset and more. On my "Mindbody Science" page, I explain the body's natural pain response. I'll repeat it here for clarity. The pain signal is first processed by the Brain Stem (our Fight or Flight Center) that connects directly to the nerves of the spinal cord. It creates the involuntary withdrawal from the pain source. The pain signal is next processed by the Limbic Brain (the seat of our emotions) which may add an emotional quality to the response. This is particularly true in the case of unrelenting chronic pain. Finally, our Frontal Cortex begins subconsciously planning how to minimize the pain usually by initiating an "alert" state. It's intended to prevent us from repeatedly touching a hot stove for instance; however, when pain is chronic (the same as repeatedly touching that hot stove) as with fibromyalgia, that alertness becomes hyper-alertness and leads to anxiety. Many people today are looking for a quick fix to get their anxiety and stress levels under control. The problem is that the quick fix is often in a medication that can easily add to the list of side effects. And then, if that initial medication is not working, they might want to up the dosage or add another drug to ‘help out’ the first drug. That makes no sense at all, really. Maybe you’re dependent on food, recreational drugs, alcohol or some other addiction to "calm" the anxiety. This is also not a good idea. In my case, although I never took drugs for anxiety, I did go through a phase when I was over utilizing massage therapy to help me relax. Sounds like a good alternative UNTIL I realized that spending $300.00 or more every month on massage therapy is not good financial health. Many studies have been done on the use of both effective exercise and meditation to control anxiety and stress. Getting out of our 'comfort zone' can be one of the best stress relievers ever. You wouldn’t think so in the moment, but studies also show that people who work at home are more prone to disease. I believe this goes for anxiety and fibromyalgia as well. Social anxiety disorder is very common in people with fibromyalgia. Feeling different or "defective" in any way can lower self esteem. It is very important what we do during our "alone time". It has been shown that excessive TV watching can decrease self esteem and lead to more social anxiety. Therefore utilizing the tools below and in the summary protocol can be effective in controlling social anxiety. Although it is important to understand that throwing oneself into a group situation in order to deal with anxiety "head on" is not always a good option and can ultimately lead to more withdrawal if tools are not implemented consistently. Movement and structured exercise are still the most effective, non invasive Rx's for anxiety. Meditation is FREE and can be done at any time. In my protocol I suggest meditating for 40 minutes per day; that is 20 minutes, 2X per day, once in the morning, and then later afternoon or evening. If Deepak Chopra, the “world class authority” on meditation, can do it for two hours every morning, I believe we can all find 40 minutes. I also highly suggest reading “The Power of Now” by Eckhart Tolle, for an effective and easy way to meditate. This book is listed on my Resources page and is an excellent resource for mind body health. It has given me great insight and clarity about the connection between the pain body in fibromyalgia and mind body work. Deep breathing is also an essential tool to relieving anxiety. There are many techniques to breathing, the key is to find and practice what works best for you. I like to take about 10 minutes for intentional breathing; breathe in and hold for a few seconds, then really exaggerate on the "out" breath and focus on letting go of anxiety, stress and negativity. Also, breathing in and out through the nostrils is great for balancing the adrenal glands. Or, alternate with mouth breathing and nostril breathing in the same session. If you follow here in the website, or on either of my two facebook pages, you know that I often talk about safe and effective exercise. This is well verified for increasing our quality of life and decreasing overall symptoms in fibromyalgia. The key is that it must be done properly. Follow me on the Fibro Fit People page, and check out the video section there anytime. I have some very short videos with simply two or three moves, and then I also have some longer videos where I am showing standing or other range of motion exercises. I modify or develop exercise specifically for fibromyalgia and chronic fatigue syndrome. GABA, Theanine, Passionflower, Valerian, the Vitamin B complex, and a variety of adaptogens such as Rhodiola, Ashwagandha, Ginseng, etc. It is also important to note that 5-HTP can increase anxiety in some people and melatonin is not always acceptable for people who have auto immune conditions on top of having fibro. Proper sleep is essential as well and I often refer to it as the number one tool. Anxiety is intensified in an already vulnerable person who is not getting REM sleep. Cortisol levels are higher and reaction times are greatly decreased when quality sleep is not attained. 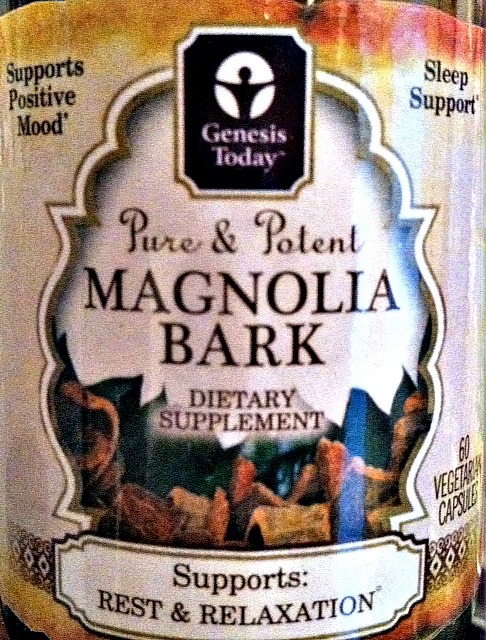 Genesis Today Magnolia bark. For rest and relaxation. Helps to lower and balance cortisol which is often abnormal in those of us with chronic illness or any auto immune illness where the body is in a constant fight or flight mode.Safe and natural. Using a weighted blanket has been shown to reduce anxiety and balance the nervous system. Don't get the wrong idea, his doesn't have to feel heavy to be effective. Read more here about using a weighted blanket for anxiety and helping you to get more restorative sleep with fibromyalgia. Many of us with Fibromyalgia have interrupted sleep patterns and therefore this tool is often easier said than done. See my "Body Clock" page on sleep help. Many recent studies have shown that 7 to 9 hours of sleep are required for good health and reduced anxiety symptoms. Also, there are several studies that indicate that more than 9 hours can be detrimental.